You can’t stay in New York without seeing at least one Broadway – or Off Broadway – show. But what is Broadway and what isn’t? I thought ‘Off’ Broadway referred to something on the fringes of the district or more experimental. But it’s nothing quite as dramatic. I’ve discovered that it actually all comes down to the seating capacity of the theatre. A Broadway show is one in a theatre with a seating capacity of 500 or more. Off Broadway shows hold 100 to 499, while Off-Off Broadway shows are even smaller and usually the experimental ones. Makes sense, yes? 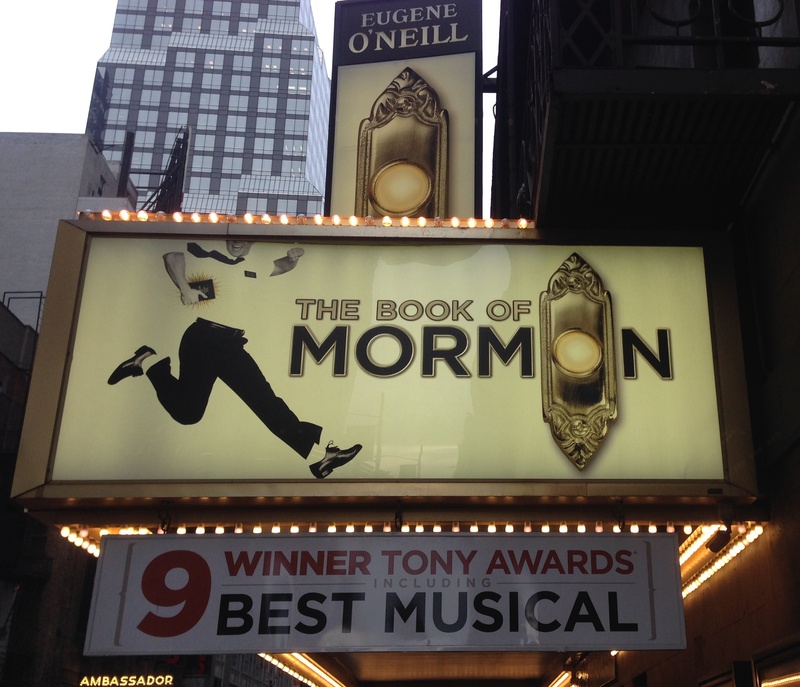 Our first show was The Book of Mormon – and what a baptism of hilarity on Broadway that was. I hadn’t read any reviews, just picked it from a list of shows before coming here, purely based on its religious flavour and those outrageous SouthPark guys who created it. From the opening ding-dong ditty, throughout this magnificently layered, gaspingly clever musical, and to the end where you are lifted to your feet – these guys have (ahem) totally nailed it. If you’ve had a religious upbringing like us, you just have to see it. If you haven’t, you just have to see it. Next week, we’re seeing Cabaret. It won’t be as irreverent I’m sure, but we’re looking forward to it. This stuff is pretty addictive – and, hey, when on Broadway…!